The Model 1Ci is living proof that designing and building a great entry-level speaker doesn’t require as much ingenuity and skill as a cost-no-object flagship- it requires even more! The Model 1Ci is a time- and phase-correct speaker constructed in such a way that the alignment and positioning of the drivers allow a point-source wave front and maximize the phase coherence of the loudspeaker at the listening position. Dimensional Purity in a shockingly affordable full-range speaker. Standard finishes includes oak, dark oak, walnut, dark walnut, cherry, maple, mahogany/walnut and black oak. Please note: specialty finishes may include additional charges. Contact a customer service representative for additional information. 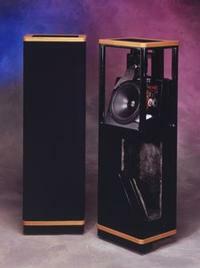 I've owned the 2CE's and bought a pair of the 1Ci's for a smaller room. It's takes about 200 hours of break-in time to get these things to sing. I've got them hooked up to a pair of older B&K M200 mono blocks & a Rogue tube pre-amp. They have a more balanced sound than the 2CE's - which have a over-dominate bass on certain recordings. Unless you can sit 8-10 feet away in a larger room these 1Ci's hooked up to top quality equipment are the best speaker deal on the market - period. They're open/airy/transparent with very surprising bass response. Very low listener fatigue so you can enjoy them for hours.